My odyssey to discover what has been causing my skin allergies (written about here) recently found me at the makeup counter trying to find some products with less irritants than the ones I was using. I figured my decade old makeup brushes were probably covered in germs and needed to be replaced. I stumbled upon these fabulous brushes by Trish McEvoy and have to say I am thrilled with them so far. 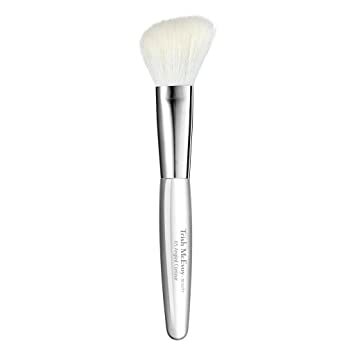 The most brilliant design choice is that the brush head for the blush brush and the eye blending brush are made of white hair. You know when you put on your makeup only to find that your brushes have left 2 inch long black hairs sprinkled on your cheeks and chin? Well, these brushes make that nasty little problem a thing of the past. They haven’t been shedding so far, but even if they ever do, no one will know. I bought the eye blending brush, the tapered blending brush, and the angled contour blush brush.